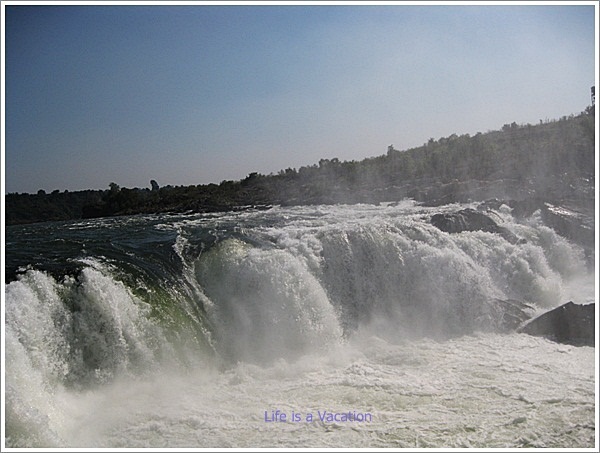 While in Jabalpur, the Bhedaghat area where the Dhuandhar Waterfalls and the Marble rocks are located is an absolutely must visit. The road to the Dhuandhar (misty+fall) Waterfalls from the parking lot is vibrant and colourful. The otherwise quiet flowing Narmada playfully jumps across the rocks and tumbles down almost 10 metres in royal gusto creating a smoky and misty environment which led to its name. As I walked down the path towards the water fall, I saw a couple faithfully praying to Lord Shiva seemingly asking for a boon only they are aware of. A little ahead to my left there was a statue of Lord Hanuman (Monkey God) on the rocks smeared in vermilion who smiled at me in approval. I turned around to find the most amusing sight, 2 young men selling slices from this huge trunk which they claimed to belong to the same family of trees that Lord Rama (a mythological personality) also consumed 5000 years ago during his 14 year exile in the jungle. We knelt down to take a bite of that famed slice to purge ourselves of earthly ailments and whatever it was it did taste good. The lines between faith, belief and reality are often blurred and it is best to soak in the moment without expectations. In India, faith and colour go hand in hand and no celebration is complete without a dash of colour. This is all the more evident in most pilgrimage sites or wanna be pilgrimage sites. Rows of women dressed in bright and colorful sarees with their back to the sun were selling colour (gulal) to equally colourfully clad women who sat across bargaining for the best deal. Sometimes, these conversations are hilarious and charming for it brings you instantly in touch with the India of the masses. There is a cable car that goes right up on the cliff next to the river offering great aerial views of this natural wonder. We watched the falls from a distance, walked on the rocks near the river side where pilgrims take dips and offer coins to River Narmada in reverence. Soon after carefree local children waiting around, dived deep down to collect the coins. It was almost like a game. Unable to resist, I soon found myself dipping my legs in water and cupping a handful to pour on my head ‘Namami Devi Narmade’ in gratitude for sustaining the earth and me. From ancient times, we Indian have been worshippers of nature, treating every river as the mother who protects, cares and sustains but unfortunately the practice got distorted and mis-interpreted over the years. Jabalpur was the centre of activity for Gond and Kalachuri dynasties until it was intermittently annexed by the Marathas and Mughals between the 16th to 18th century. It emerged as a major cantonment town during the British reign and post independence one of the largest ammunition factories in India was set up in Jabalpur. Jabalpur is generally the base for visiting Bandhavgarh and Kanha National Parks which are famous for sighting the Tiger in the Wild. They are within 3 hour driving distance from Jabalpur. The city is connected to larger cities through rail and air. While on the trip take a boatride on the Narmada in Marble Rocks, visit the Chausath Yogini Temple, climb Trikuta Hills near Maihar in search of Mother’s Necklace. 🙂 I have often noticed people getting judgmental on faith and belief that others practice and losing precious moments to be one with nature..